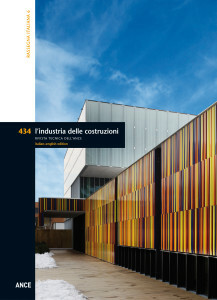 L’Industria delle costruzioni is a bilingual architecture journal, published in Italian and English. The magazine’s scientific content reflects current research in Italy and around the globe. Published bimonthly in printed and digital format, each monographic issue (6 per year) is edited by experts invited to examine central themes of contemporary architecture and urban transformation. Proposed themes are evaluated by an editorial board assisted by a team of external referees, both Italian and foreign. Evaluations are made in accordance with criteria of blind peer review (in conformity with international standards for scientific publications ISI). The magazine is present in leading catalogues and the most important national and international libraries. Consult the new L’Industria delle costruzioni Data Base dedicated to contemporary architecture. The Architecture Database is an open and free archive. Users can access constantly updated photographs, drawings, texts and data using a simple search engine based on criteria of location, architect, category or theme.